A long time ago there was a comedian who used to do a recurring skit where he would exuberantly mention a little known food at the time called Pasta Fazool and the audience would roar with laughter. 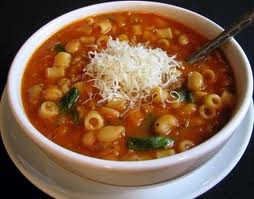 Years later I learned it was the Neapolitan pronunciation for Pasta e Fagioli, a wonderful, stick to your ribs, thick soupy dish with tons of flavour. Fagioli (beans) sounds like ” fa Zhole” so it’s easy to see how the slang fazool came about. But any way you look at it, its good to eat. There are a lot of ways to make pasta fazool, but I think closest to the original way is best. Since it was a peasant dish, it didn’t often have meat in it unless it was some leftover scraps. Not everybody used tomato in it, although many people used leftover Sunday sauce as a base. You could cut down on the celery, use more carrot, and even put ham or other meats in it if you choose to. It is very good without any meat. Pasta Fazool is a very simple, hearty dish, soupy enough to be served in bowls rather than on plates. Fry the bacon, stirring occasionally until nicely browned in a dutch oven or soup pot. Remove the fried bacon and reserve 2 tablespoons of the fat. Add I tablespoon olive oil to the pot. If not using bacon add the ¼ cup of olive oil now instead. Add the next four or five ingredients and fry gently till tender, 5 to 10 minutes. Put in the next four ingredients and simmer for about 40 minutes. (Taste a bean for tenderness). Check liquid levels and add water as needed. Now put in the pasta and cook until it is just slightly firm, called al dente. Taste to test. When it is cooked, take off the heat and put in the parsley. Let it sit a minute while you get ready. Dish it out and let the diners put plenty of parmesan atop their bowls. Offer a little olive oil to each bowl as well. Come on paisano give it a try; you’ll be saying “Mangia Mangia” right away. I do love soup. My wife can't understand how I can eat it in the dead of summer. But I'm from Michigan and she's from California. Soup is seasonal here but eaten year round where I grew up. Thank you for this recipe, I *love* pasta e fagioli! It's making me so hungry as I read this. this is a keeper for my once a month continental dinner! it reads thick and warm and creamy delicious and the name is so cool too...pasta fazool! flagging it! This sounds delicious, and I love that you gave us recipe options to omit the bacon. I use can beans for almost everything except beans and rice. So question: can one use canned beans and skip the need to soak. Does it make a difference in the flavor? This sounds yummy. You can substitute canned beans. I would rinse them though, ok? If you like the taste and texture, use canned all the time. My mother's first husband was Italian and she often talked about how she learned to make 'pasta fazool' the way they did it in 'the old country'. Cute post! This sounds divine. True comfort food. It reminds me of a dish we had in Greece with dried lima beans called Plaki. Also Mediterranean. Thanks for visiting my blog.